I wasn’t actually sure I’d be able to go fishing today as my amazing, lovely Mum passed away on Friday morning after battling a brain tumour for the last five months. It’s been a horrendous time for my Dad and me watching her deteriorate and I wouldn’t wish it on anyone but at least she’s at peace now. I didn’t really want to spread it all over the blog, especially as the majority of you didn’t know her but I felt I needed to say a few words. As it was a pairs match, I also didn’t want to leave my partner Fieldy in the lurch and I felt it might do me some good to get out of the house for a bit. I actually managed to get to the draw early for a change and the pub was already pretty busy as there were eighteen anglers booked in for todays match including a few more new faces. I paid my pools for the pairs and there was an individual super pool as well, Stu Alford announced the draw which was in two stages, firstly to decide which section we’d be in and then secondly to decide which peg. I pulled out peg 2 which put Fieldy on peg 14 in the other section. I took my kit to the peg and found myself in a Tackleuk sandwich with Scott Russell on peg 4 and Andy ‘Mr Matrix’ Downton on my right in peg 1. My rigs for today were a Drennan 1 gram Tipo for fishing on the deck and my shallow rig was a Preston Chianti, both had 0.10mm hooklengths with size 20 B611’s. I was ready in good time and had a chat with Scotty, we both agreed that it could fish quite hard today with 10lb being a good weight due to the number of anglers around the pond combined with it being flat calm, bright and sunny. 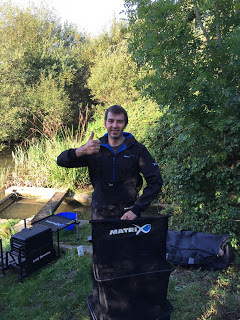 The whistle went and I cupped in two balls of Bait-Tech Pro Nat Dark at 10 metres and first chuck the float sailed away as a roach nailed the caster on the drop, it was a bite a chuck and I had 15 fish in the first half an hour although only a couple required me to use the landing net. 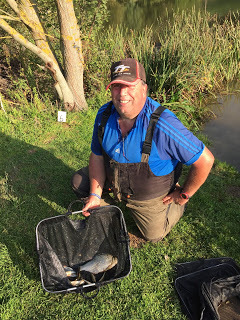 I could see Ash netting odd fish in peg 15 and Scott Jackson on peg 20 was catching quite well shallow but as they weren’t in my section I wasn’t too worried. My bites started to slow up and I only added another 9 fish to put me on 24 after an hour so it was time to try the shallow rig. 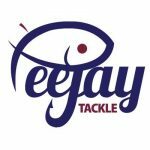 A couple of quick fish proved to be a bit of a false dawn, I stuck on another section and started feeding two lines at 11.5 metres with hemp and caster and switching between the two my catch rate improved and I was getting the odd better roach in amongst the 1-2oz fish. 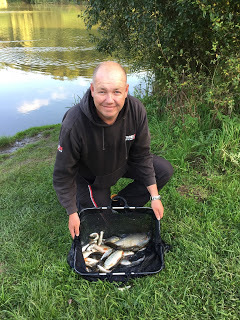 From what I could see, nobody was catching that well, Paul Adams on peg 19 and Jake Woodard (peg 21) were both fishing the feeder and struggling although I had seen Jake land a decent skimmer. By the halfway point I was up to 57 fish and thought if I could catch the same in the second half I would hit my 10lb target but the trouble was, my bites were dwindling and from the comments I was hearing it seemed to be the same for most people so as long as I was putting odd fish in the net I felt I was doing okay. 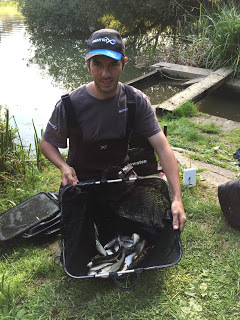 I struggled on but bites were now few and far between, I tried the deep rig again and had a couple of fish but had to wait ages for a bite, Steve Parker on peg 18 had started to put a few fish together and my pound was in serious jeopardy. Jake was swapping between the feeder and the pole so I thought he must be struggling, Scotty Jackson was catching bits and bobs on the whip and rumour even had it that Scott Russell had set a feeder up! With an hour to go it was obvious I wasn’t going to reach my 10lb target as I was having to wait ages for bites and the roach were now on the small side. When the final whistle went my clicker was reading 85 fish and I thought I might have 5-6lb, Andy D said he thought he probably had around the same and I was still hopeful I might end up with decent section points when Scott shouted down that he’d really struggled too and that most people to his left had caught bream or skimmers! I asked if he’d caught on the feeder and he said he had one skimmer just before the end. 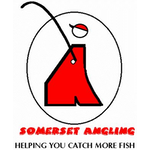 Hurf arrived with the scales to begin the weigh in with Andy in peg 1, he had 5lb 6oz and said he hadn’t seen a sign of a chub by the bush, my fish weighed 7lb 14oz and then Scott just pipped me with 8lb 4oz so that late skimmer came in useful!, John Dursley had 9lb 13oz of skimmers from peg 5 and Mike Board had 2lb 3oz. Stu Alford had 8lb 2oz which included some nice rudd and then Big Frank had two nice bream plus some skimmers for 12lb 5oz from peg 8. 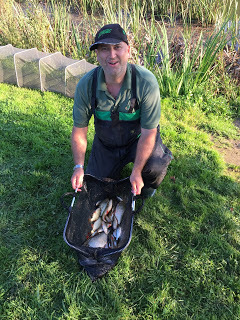 Ian had 2lb 10oz from peg 9 before Hurf had a big bream and a couple of skimmers for 8lb 7oz from peg 10. So there had been a lot of close weights in the section with only 9oz separating third place and me in sixth and I was really hoping I hadn’t let my partner down. 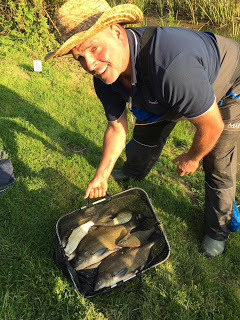 The others drove round to meet us and do the results and the other section had been hard going for most, Fieldy had 3lb 7oz and Ash had 4lb 9oz which just goes to show what a struggle it had been although Ash did lose two good fish and an eel. 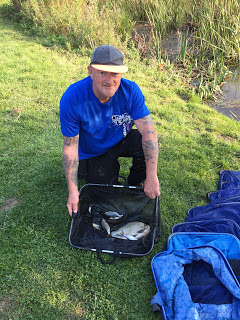 Scott Jackson won the section with 12lb of roach and had done really well again, I keep saying he ought to fish more matches but as he normally gives us a battering maybe it’s better he doesn’t! 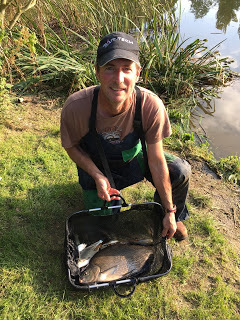 Glen Radford was second with three chub for 10lb 3oz and he lost three big fish as well and Steve Parker was third with 6lb 15oz so at least I won my pound. The results were worked out and it was all very tight with only a single point separating the top three pairs, Frank and Jake Woodard tied with Steve Parker and John Dursley on five points but took the verdict on weight and Scott Jackson and Stu Alford were third with six points. 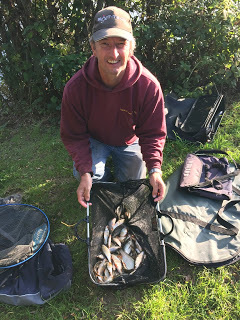 On the individual front, Frank took the honours again and is the man to beat at the moment, Scott Jackson was second with a cracking net of roach and Glen was third and had done really well on his first visit. 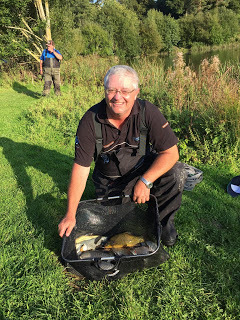 So a really close match and it was great to see some more new faces fishing, hopefully the club will run some more opens on the pond and I’ll put the details on here if they do. On a personal note, I really wanted to do well today so I could dedicate it to my Mum so rest assured I’ll be trying my hardest next week when we’re back on the river. Hi Jamie. I'm very sorry to hear the sad news about your mum and hope you and your dad can find solace in remembering the good times. I have a new phone and have lost your mobile number so please ping me a text – I still have the same number. Sorry to read that you've lost your mum. I know what you've been through, difficult time. My best wishes to you and your Dad, stay strong and tight lines. Jamie, so sorry to read about your Mum. We've never met but I read your blog every week as I sometimes fish the Isle and Dillington. Keep up the great work. 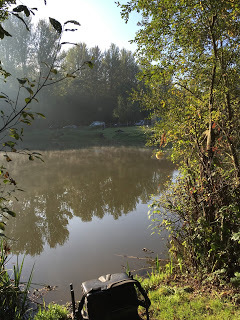 Hi, thank you for your kind words and I'm glad you're still enjoying the blog, hopefully we'll bump into each other on the pond or river soon.